TORMEK T-4 is an enhancement of the T-3 model taking the precision and stability to a completely new level. Vital functions like the motor and the main shaft are mounted in the zinc cast top which includes the integrated sleeves for the Universal Support. This advanced design ensures an unbeatable precision for the Universal Support, which is the foundation of the Tormek jig system. You get a high quality machine ideal for home and hobby work which can sharpen all the common edge tools. Delivered with the Stone Grader SP-650, AngleMaster WM-200, Honing compound, DVD and the comprehensive Tormek Handbook on sharpening. Configure the T-4 with your choice of jigs according to the tools that you are choosing to sharpen. The jigs are sold separately. Silent running, 54 dB. 10,000 hour life. Makes the machine easy to place and put away. 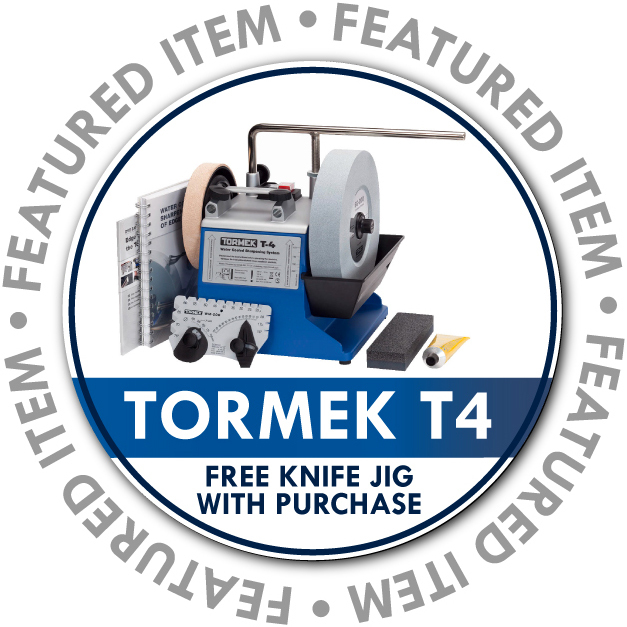 Now you are able to configure your Tormek right from the start with the jigs that fit your sharpening needs. For example if you only sharpen knives you will not have to pay for something you will not use. Regardless of what tool you will sharpen you will need it, so we decided to include it from the start. Make sure to use it and you will always have a fresh cutting stone. Also, with the Stone Grader you get two different cutting actions (fast/fine) out of your grindstone! Thanks to the patented zinc cast machine head, we can achieve the same precision as with T-7, which is made with 3 mm steel housing with precision sleeves for the Universal Support.